* FTC disclosure: I was send a pre-release copy of the book for the purpose of this review. The reviews and opinions expressed are my own and I was not compensated for them. 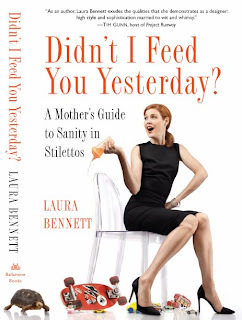 I am going to start by admitting until about 5 weeks ago I didn't know who Laura Bennett was. No I don't live under a rock (not a big one anyway) we just dont' have cable. No cable, no Bravo, No Project Runway. Otherwise you know fashion loving me would have been and avid fan, and from what I have seen online in my research I would have been Laura Bennett's biggest fan (but since I don't that award goes to Melisa) However I think that was a plus because I went into this book with no preconceived ideas about who or what Laura was and I wasn't looking for anything in this book but a good read, a laugh, and maybe a tip or too. I got so much more. Laura Bennett wowed viewers of Project Runway's Season Three with her own politically incorrect brand of humor and sophisticated designs. She has a large and growing fan thanks to Project Runway, MSN's "Glam Squad" StyleStudio, and QVC, which sells her designs. Bennett's writes a Case Clothed comic strip for iVillage and a column for The Daily Beast. She lives in Manhattan. She is also a mom of 6, 5 (yes you read that right, five) boys. Oh and did I mention that those 5 boys live with her, her husband, and a variety of pets in a 2 bedroom Manhattan loft? You would think she was super women, but you know what, she is just like you and me. Really. She says in her book "I have discovered one of the great secrets to being a perfect mother: there is no such thing" and with that line she sealed the deal, I was in love! The book talks about how she does it, balances life and kids. The importance of taking care of you, making sure mom has what she needs (whatever that may be, for Laura, it's fashion and heels) so that she can be a good mom. She introduces all her kids and their quirks (she has an adult daughter from a previous marriage and 5 boys at home, including one with a learning disability) and the help she has (of course she has help, 5 boys! in the city!). How she meet her husband, the basic format for a light hearted essay book. She of course dives into a bit of the details of Project Runway and has a great chapter on fashion (there will be another post on this sometime next week!).
" I don't have all my eggs in one perfect little basket; I don't need every child to be a straight-A Ivy league admitted music-and sports prodigy"
In a world with so much over parenting of our children this was a refreshing take on the competitiveness of raising children these days. "Can anyone explain why it is so hard to pee into something the size of a platter with something the size of a cocktail sausage?" Can you imagine what her poor bathroom would look like without a cleaning lady? Seriously? I don't want to give away all the book though, because it's a short read and a funny read and we all need more funny in our life. If you would like a funny, tongue in cheek look at the modern parenting, run, don't walk to your nearest store (or click that image above, which will take you to Amazon, and earn me a penny or two) and get this book! Laura has given me 3 (THREE) copies of her book to give to my readers! All you have to do is leave a comment on this post telling me why you want it? - For the funny parenting stories? - For tips on how to be fashionable? - To see if she is sane living in such a small place with 5 boys? - Because you are a Project Runway fan and want to get the inside scoop? You can get one additional entry if you become a Facebook fan of "Didn't I feed you Yesterday". Please leave a comment telling me you did with your name and last initial. All entries must be received by Midnight on April 15. Winner(s) will be chosen using Random.org. Please be sure to include your email address in your comment if it is not in your profile so that I have a way to contact you if you win. If the winner(s) does not respond within 48 hours of being notified a new winner(s) will be chosen. Okay - I am a closet Bravo junkie and really liked Laura on Project Runway! I think of all the designers, she is most in line with my taste. As far as sticky floors go, after a month in the serviced apartment, I still wait to clean my own floors because I figure someone else will do it during the weekly cleaning. Aha! Parenting moment - Nothing is more humbling than when a baby starts to crawl and you see how dirty their little pants get as they move across your floor! I liked Laura on PR and I am impressed at anyone who can be fashionable with that many kids! I want this book for the funny. 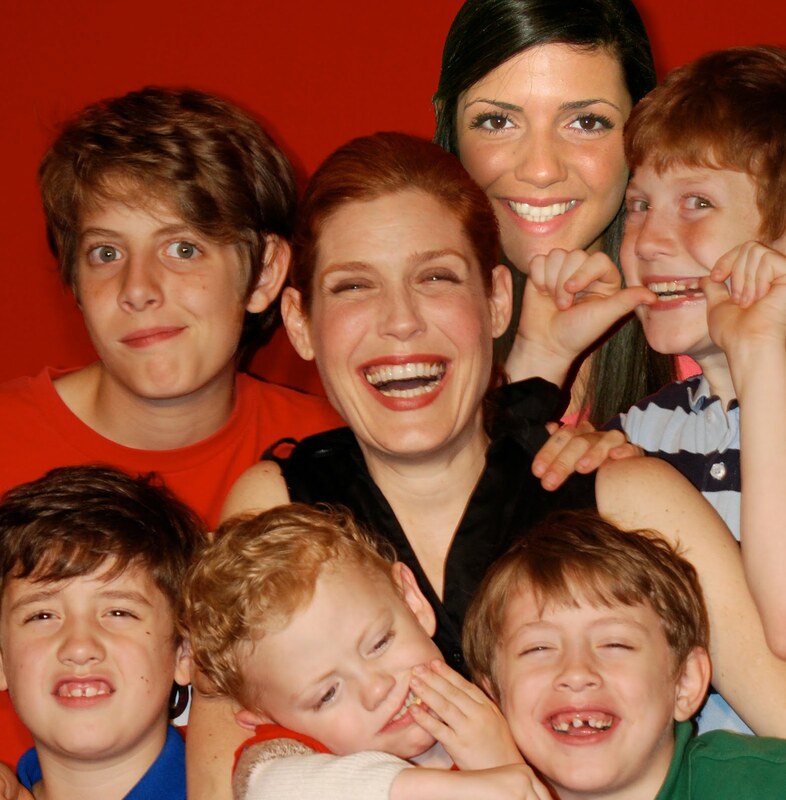 Raising 5 kids myself, I bet I would get some good laughs. I already gushed about my love for Laura on your interview post! So, I'm sure you can guess that I'd love this book! LOL Okay now I must read this book! I'd love it because it would make my ife with two girls seem a little more managable! This is very cool. Sounds like something I'd say to my own kids. I loved Season 3 of Project Runway and Laura is a funny, no-nonsense, talented woman: I'm sure I would love her book! This sounds like a really great read! Laura was my favorite on her season! Funny parenting tips from a mom of boys. I'm in! Please enter me for one copy as long as it's open to Canadians :)Thank you. Oh how fun. I've seen this book elsewhere, and I *love* the concept behind it. It sounds like such a fun and light (in a good way) read! I want it because I really want to know what it's like living with five kids - especially in a small place! Linked here from the CBC forum - this sounds great! I'd definitely want it for the funny parenting stories. I love hearing that other moms are just as nutty as I am. I want it for the fashion, definitely. I would still rather buy clothes than something for my house, which is what I always thought the difference was between me and my mom. now I am a fan of the book, too! I absolutely adore Laura Bennett! I thought her clothes were fabulous on Project Runway and I would love to hear her parenting stories. Oh I could use some funny parenting stories. Sign me up! I've never heard of the book or her but it sounds like something I need to read! I need more laughter in my life. I'm a total Project Runway geek (like, every week does the same challenge with them, though I give myself more time and sleep ;) I loved Laura! She had such a dry sense of humor that I imagine I'd love her writing as much as her dresses! The book sounds huliarious and right up my alley! !